Providence Art Windows is pleased to announce that its next exhibit will be on view from December 5, 2009 - March 12, 2010. The art and art installations presented in nine downtown windows are by Rebecca Adams, Anne Alexander, BUY ART Providence, Margie Butler, Paula Dewell, Amy DiPlacido, Lynne Harlow, The Museum On Site (Andrew Losowsky and Lyra Monteiro) and Jillian Piccirilli. The winter installation series contains artists selected by the jury that reflect color, light and investigation of neighborhood and fanciful history. Bright fabrics will be displayed in two windows on Eddy and Fulton Streets; at Eddy Street, Lynne Harlow will fill a window with hot pink fabric and tape, and Amy DiPlacido will have a hanging line of hand-dyed clothes in graduated colors on Fulton Street, presenting a fictional production line of clothing. On Westminster Street, BUY ART Providence will artfully arrange a window, showcasing other venues where you can buy art for the holidays that is local. Anne Alexander will hang metallic, seaweed ceramic forms which will float and ebb as if in the sea. For “Westminster Stories," by The Museum On Site, a series of labels will share stories about Downtown Providence collected by Andrew Losowsky and Lyra Monteiro. These labels will change every week and detail history of the buildings and the lives of the people who use them. Jill Piccirilli’s “The Paws Family,” displayed at Eddy and Westminster Streets, is a story conceived by the artist and her family about a fictitious family of rabbits, and the windows will display the Paws family, spanning four generations. The window should delight children to adults with its whimsical story. On Washington Street, Paula Dewell presents light filled landscapes in the University of Rhode Island Library windows that will transport the viewer to warmer days. Margie Butler will present long scrolls recalling memories of home at RI Housing. Finally, Rebecca Adams takes a turn for the dramatic in her representations of women in a range of emotions in the Trinity Rep windows. Join the artists at Design Within Reach (210 Westminster Street) on Saturday, December 5th, at Design Within Reach, from 3-5:30 PM. The Providence Preservation Society Holiday Stroll will be happening at the same time, and the reception will wrap up before the 6pm tree lighting at City Hall. Plan to come Downtown and watch the windows transform the week before if you cannot make it to the reception. 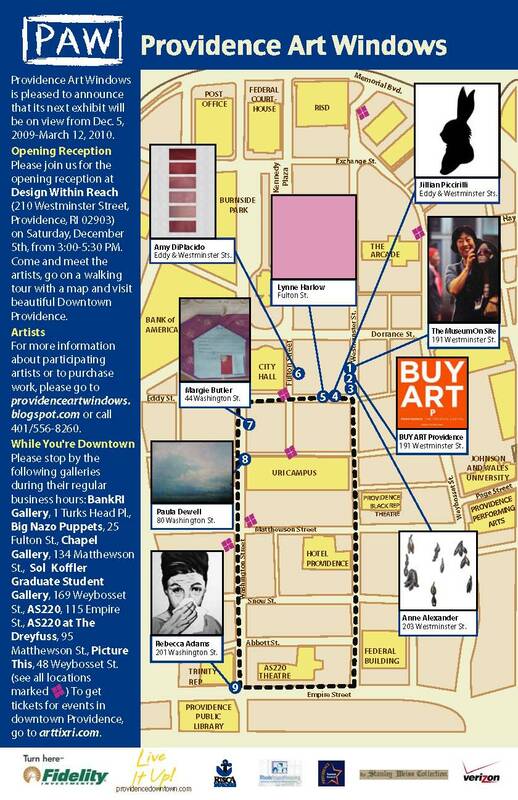 To take the tour on your own, download the map above, or pick a paper copy up around Downtown Providence.